The Security Page allows you to work with secure archives. • No Encryption - The contents of the archive being created will be accessible to everyone. • Secure Archive - Depending on the security options specified the contents of the archive will be protected and only be accessible to those who can provide the correct credentials. • Text Passphrase - Provide a passphrase in the field provided. • Text File Passphrase - Provide the location of a text file that contains a passphrase. • Use Strong Encryption - Select this option to allow strong encryption to be used. 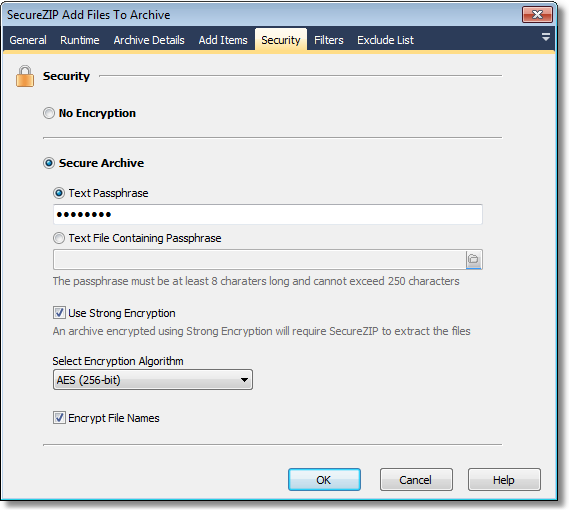 The contents of an archive that was created using strong encryption cannot be accessed without SecureZIP and the passphrase that was used to encrypt the archive. o Encrypt File Names - Enabling this option prevents an un-authorised user from even opening the archive to view the file names. Attempting to open an archive that was created using this option via Windows Explorer results in an error message indicating that the archive is invalid. Note: The value for passphrase must be between at least 8 characters and not exceed 250 characters in length. 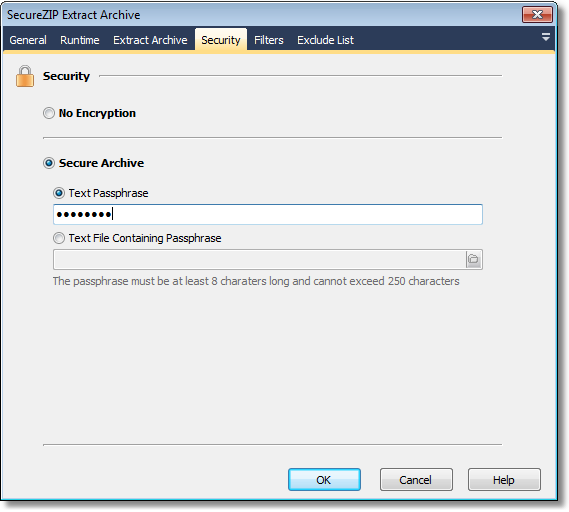 To access a secure archive you must provide the passphrase that was used to secure the archive.